Enteric Coated with a hint of Vanilla, to make it easier to swallow and eliminate that fishy odor and after taste common in other forms of Fish Oil supplements. 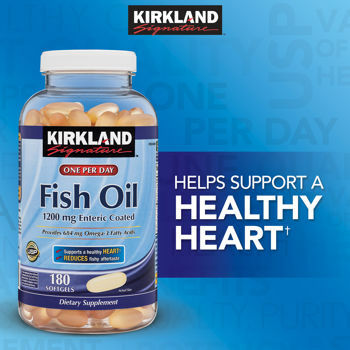 Kirkland Signature Fish Oil supply comes from deep ocean waters. Our fish oil is not supplied from farm-raised fish. State-of-the-art molecular distillation is used to remove PCBs and dioxins which guarantees purity and potency. Mercury levels are undetectable, less than 0.1 parts per million. Take one softgel daily with a full glass of water. Calories 10, Calories from Fat 10, Total Fat 1 g - 2%, Cholesterol 10 mg - 3%, Fish Oil Concentrate 1200 mg, Total Omega-3 Fatty Acids^ 684 mg - **. Fish Oil Concentrate, Gelatin (non-bovine), Glycerin, Water, Vanillin, Tocopherol. Methacrylic Acid Copolymer, Ethylcellulose, Sodium Alginate, Hydroxypropyl Methylcellulose Phthalate, Medium Chain Triglyceride, Triacetin, Oleic Acid, Stearic Acid, Ammonium Hydroxide, Polyethylene Glycol.